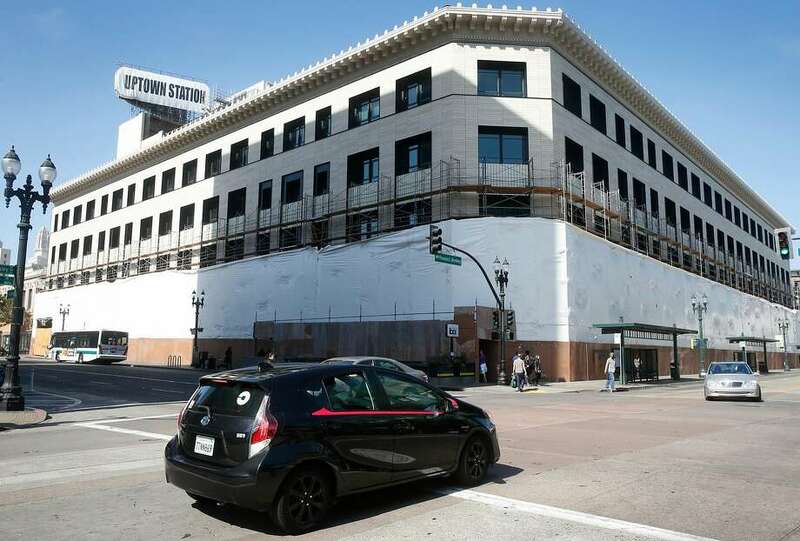 The sale of the waylaid Uptown Station development at 1945 Broadway in Uptown Oakland, which has been under construction since 2015 when Uber purchased the former Sears building for $123.5 million with the intention of occupying the new campus in the second quarter of this year, has closed escrow with the CIM Group having paid a reported $180 million. In addition to 356,000 square feet of new office space, the redevelopment includes 35,000 square feet of ground floor retail. “In addition to…” a large garage in the basement. And for the record, it appears the building will not have this two tone color scheme, as the latest appearance is pretty much all white…too bad as that was a nice touch, saving us from monotony. This is a transformative project for this part of Broadway. 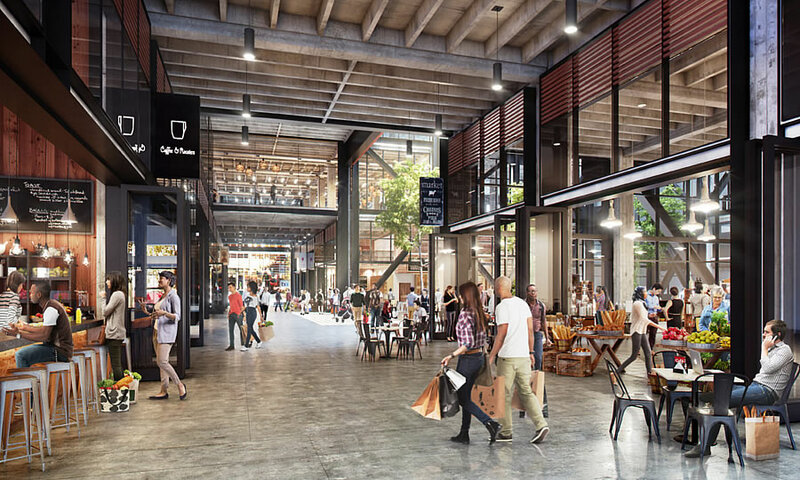 This may become Oakland’s Chelsea Market and really bring tourists to Uptown and Lake Merritt. This will be a must stop at the 19th Street BART station. This building has its own entrance to the BART station in the basement. There are also plans to add bike infrastructure along with new landscaping from the 19th Street BART station down 20th Street all the way to Lake Merritt. This is very exciting for Oakland. They need to hurry up. This project has taken too long. This building is creating an entire dormant block in a prime DTO location right now. 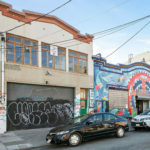 It has great potential, no doubt, and will bolster this area of DYO Oakland significantly. I don’t think a large food hall will bring tourists, unfortunately. Oakland simply does not have enough “headliner” things to do to get tourists to cross the bridge. It would take a highly rated, mainstream museum (like a Star Wars museum?) to anchor an “Oakland day” for your typical European tourists few days in the Bay Area. Lake Merritt and this food hall might be listed on that agenda, but items #4 and #5 most likely. i see obvious tourists in downtown Oakland more and more these days…i don’t see why something like this wouldn’t draw in more of them. Oakland already has a very vibrant scene going on up the street at The Hive. The Oakland Museum is nearby as is the incredibly beautifully Paramount and Fox theaters. Also with the Oakland Zoo, Mormon Temple and Redwood Regional, Oakland has plenty of attractions. Tourists are kept in the dark about Oakland. This beautiful building could help change that. All a conspiracy by the nefarious San Francisco Travel Agent Cabal, (STAC for short) no doubt! No, free media hype and advertising for SF events such as fleet week, concerts at Golden Gate Park, Chinese Parade, SF conventions while also downplaying crime in SF while magnifying crime in Oakland. Oak also has a small tourism budget. 10 people working to promote Oakland compared to over 70 working promoting SF. The results equal tourists in the dark regarding what Oakland has to offer. Haha, let’s all go see the Mormon temple. That is truly unique to Oakland. As noted, Oakland does indeed have a lot going for it, but very little that’s actually special. A lake, yes, and restaurants, theaters, parks and neighborhoods– like many other cities. It gets a bad rap that it doesn’t deserve. But it’s not unique. Oakland is very unique when you consider it has beautiful rugged topography similar to Marin County along with the attributes of exciting urbanity around Lake Meriitt, Uptown, City Center, Old Oakland, Preservation Park, Chinatown and Jack London Square. Oakland offers a mix of urban, suburban and even rural neighborhoods not seen in SF and most cities in the United States. Anyone without a bias who knows Oakland in its entirety would agree that it trully is a great city. There is nothing like the Mormon Temple in SF. This temple has the most beautiful setting and grounds of any Mormon Temple in the United States. People that wants to see a grand Mormon temple (or anything Mormon) usually go to Salt Lake City. Every mid-sized city in America has a modern “food hall” sort of thing. Even Emeryville has one. 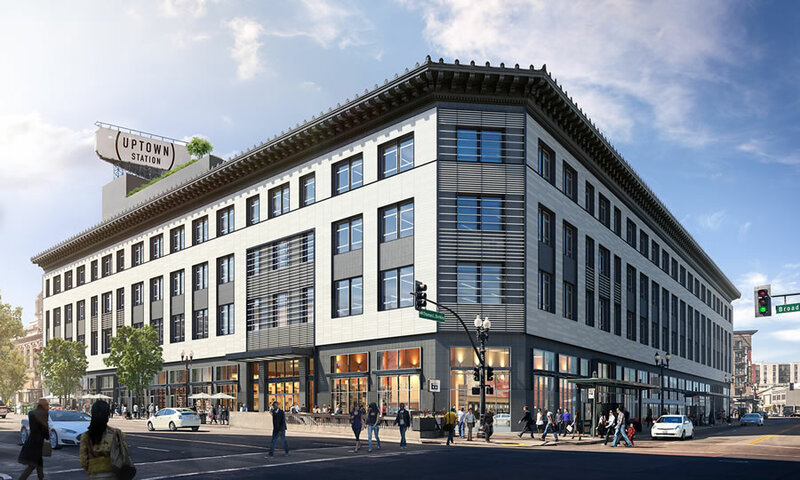 Oakland already has Market Hall on College Avenue but the 35,000 sqft of retail in this building offers a much greater opportunity to create something special for the entire city and also create a regional attraction for the Bay Area. The concept itself is old (Swan’s, Housewives Market). Sitting right on top of a subway station the location couldn’t be better. People going to events nearby will have options and there are hopefully enough office workers in the neighborhood to support it as well as nearby residents. It will undoubtedly take on it’s own persona, it does not have to be modeled on Chelsea Market. Good call. Swans Market is a good example in Old Oakland. Of course this would be much bigger. Is Swans really a success, though? It always seems half empty during many periods. And too small to ever serve as a major draw in itself. I don’t know if Swan’s is successful as a market, but as a bunch of restaurants it’s doing a ripping business. Before Dominica Rice opened Cosecha, almost the whole building was empty. Now there’s 6? 7? restaurants in there. Why, I pray that you’ll tell me, would a person who has limited time in the Bay Area bother with Oakland’s downtown? As I type this Oakland’s center city is the most nondescript downtown of any city I’ve been too recently. I live here but really, Boise, Portland, Denver even Sacramento have more interesting, walkable central city areas. But hey, it’s got San Jose beat. The best we can hope for is for Oakland’s downown to be a working livable core for the residents of the city and region. i dunno…i think downtown Oakland is clearly ahead of downtown Sacramento, and most other big cities in America for that matter, when it comes to amenities, density, and pedestrian activity. And I say that as someone who was born and raised in SF. I would agree vis a vis Sacramento. The energy in Sacramento is scattered through key blocks in Midtown, well east of the traditional downtown. K Street remains pretty scary, although there has been money pumped into it. I don’t understand the hatred for San Jose, though. It has a lovely square (when not filled with ferals), a major creekwalk, quite a few restaurants, and better designed housing (still too monolithic and massive in scale) than the grim East German Warehouses built along Second, Third, and Fourth. I like Oakland quite a bit. But to make a statement that its downtown beats most American downtowns seems to be a major stretch. What other city has a Lake twice the size of the Central Park Reservoir on the edge of its downtown. Oakland has a very cool and walkable downtown. From Lake Merritt, to Old Oakland, Preservation Park, City Center, Chinatown, to Jack London Square. And honestly, nobody cares there. Nobody cares to visit Oakland as a tourist. Oakland has a lot of potential. I just don’t know if City Hall can pull of a large scale transformation of the downtown and Lake Merrit area. 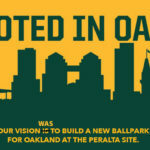 Just look at how hard Oakland is fighting the new A’s ballpark. The ballpark would be a great addition to downtown. You can’t walk around the Lake in Chicago. It’s more of an ocean. Oakland is a very unique city with tremendous character. What other city has a Redwood forest 5 miles from downtown and two separate waterfronts? You combine weather, transportation, walk ability, tremendous amount of parkland, a great dining options, a great and expanding zoo with a gondola and fabulous views, a world class Port, a booming airport, great historic architecture, varied and interesting residential architecture, we can see that Oakland is truly one of the best cities in America. What other city has a Redwood forest 5 miles from downtown and two separate waterfronts? Oakland is nice. Nothing against it. But it’s not that special. Yeah, it’s a bit of a hard sell. Nobody is like “I really want to fly there so I can walk around a lake!” I mean, really is that the best OAK has? If people want stunning views and character/things to do, they’ll just walk around the Embarcadero in SF. (News flash, they already are) Also, the downtown is dull and heavily lacking. SF has a far more interesting and vibrant downtown. OAK has a high reputation of crime. And let’s be honest, it’s not special. (and that’s totally fine) But let’s not try and say it’s a tourist destination – it’s not. SF has that trophy and surely will own it going forward. Oakland is special. When you combine weather, topography, cuisine, neighborhoods, views, parkland, green hillsides, a beautiful urban lake in the center of the city, a 1700ft Peak, walkability, neighborhood commercial districts, etc.. when i’m hiking the gorgeous French trail at beautiful Redwood Regional Park, I’m grateful that all the SF tourists flock to Muir Woods. When walking beautiful Mountain View Cemetery in Oakland I’m grateful that SF tourists don’t know it exists and are instead shoulder to shoulder at Fisherman’s Wharf. I love it but Oakland’s economy suffers for it. OMG dude(tte), you’re such a tireless oakland cheerleader. You should show your comments to Oakland mayors office; I’m sure they could arrange a six figure tourist promotions position for you. In response to Frisco “Hmmm, Seattle?”. I lived in downtown Seattle and being an avid cyclist, I searched for many routes to ride. If there are any redwoods near downtown Seattle or even within the city limits I missed them. And Seattle doesn’t have the varying topography like Oakland. It is much flatter. As far as tourism, just Google it. There has been a tremendous increase in tourism in Oakland. Oakland has huge potential. I like the fact I can drive to downtown SF in minutes, can be in the Oakland hills/redwoods in minutes, the airport in minutes, at the lake in 5 minutes, on my way to Napa, Yosemite… out of the Bay Area much faster on road trips. I forgot to add. The weather in Oakland is very hard to beat. Denver? They tore 90% of the interesting stuff down in the sixties. About the only part worth seeing was near Union Station (which admittedly was grand). On the whole I came back from a recent trip to Denver really pleased at how much better Oakland compared. Denver is actually surprisingly…bleak…as a city overall. It’s basically Platte City or Cheyenne. High Plains bleakness. Mountains are relatively close, but not dominant at all. The City is overall flat as a pancake with few natural landmarks in the metropolitan core. Tourism in Oakland will be driven by Bay Area locals who are looking for something different. Tourists arriving from farther away will focus on SF, LA, and maybe Portland/Seattle/Vancouver. They won’t be likely to budget a day for Oakland. There are exceptions of course, myself included. Not many people skip over Prague to hang out in Olomouc or Ostrava, but some do. Tourists are not informed about what there is to do in Oakland. Tourists don’t know that Oakland has a Zoo featuring a new gondola offering spectacular views in a more beautiful setting than the SD Zoo. Tourists don’t know that Oakland has one of the most beautiful cemeteries in the United States that is more beautiful and has better views than the famous LA cemeteries that they would want to visit. Tourist don’t know that Oakland has a peak with magnificent views which is 1,000 feet taller than Twin Peaks in SF. The NY Times published several articles about how Oakland was one of the top cities in the world that everyone just had to visit. I don’t think it’s exactly unknown. And there are so many visiting foreign students and professors at UC Berkeley that international familiarity with the east bay is higher than you’d think. At least, higher than you’d think if you never leave the SF bubble. Most people at UC Berkeley don’t even know that the UC Botanical Garden is within Oakland city limits as is a large chunk of UC Berkeley property. People in the Bay Area don’t even realize what constitutes Oakland’s 57 square miles. This is called living in the SF bubble and viewing Oakland through an SF generated narrative. Oakland is the mischarecterized city in the United States. I don’t live in the SF bubble, but I know lots of Europeans and 99% have never heard of Oakland – the remaining 1% follow the NFL. Many have heard of Stanford and Berkeley though. Sorry if that burst your bubble. Most tourists just love to kick it in random cities’ not particularly famous cemeteries, right? Most tourists like to see beautiful interesting places wether they’re famous or not. The whole east bay region feeds into Oakland by BART, from Richmond down to Fremont out to Pittsburg/Antioch and Pleasanton/Livermore, and freeways from the valley too (Stockton, Sac, Davis, etc). Lots of regional people looking for some urban fun are starting to go to Oakland vs SF. For not just the location, but the more down to earth culture as well. Can we use the word “vibrant” and talk about maker space? It’s great that it’s opening…but who is moving into the office space? No signed leases have been announced and the signage for an anchor tenant remains up for grabs. I’ve heard rumors about Amazon. I’m sure it will be a prominent company. The building and location are superb. The building is looking a lot better – I would bet they will get a good tenant. It’s old incarnation as Sears was pretty sad. They had really let it run down, but the current renovation looks to be Class A space. I thought it was UBER that was going to transform Oakland and the world? we were told this in endless breathless CofC blurbs [by E.Gonsalves on this very site]. How did that work out for you? You were SURE UBER was the salvation. How much should we depend on your certainties? Oakland is thriving. There are currently 4,772 units of housing under construction. Uber is irrelevant. That building will be filled with office workers and possibly a huge market among the 35,000 sqft of commercial space. Oakland doesn’t need a “savior.” Oakland just needs to tell it’s own story and take the narrative away from SF media and SF interests. Oakland is a great city with a whole lot to offer. The days of the dark, dangerous, bleak narrative coming out of SF defining Oakland are over. Oakland has shot itself in both feet many times over the decades, it has never needed SF help to scare off businesses and tourists alike. MAYBE the city is getting a second wind now, but if it gets another rash of arson fires, gang violence and ineffective police and city government the city can quickly be back where it was. As someone not living in the area I can assure you that Oakland is better known for high murder rates than the coming as the next boom town. Oakland will always be a “shady” part of the Bay Area and nothing will change that. It is not a SF conspiracy but a stigma. Companies will always go where it is cheaper for their back office and that is what Oakland is, a back office. Not what SF what it portrays it to be. I work near Civic Center on Market Street. San Francisco has the filthiest downtown of any Bay Area city. I live in Oakland and I can’t think of any place in or around downtown Oakland that is as filthy. I just did a survey of with businesses along Market. Most complained about the rampant drug use, human feces on the sidewalk, BART and MUNI entrance that smell like urine and trash. San Francisco better be careful and get cleaned up. It has an international reputation of being filthy. With that said, it does have a lot of beautiful scenery outside of downtown. Oakland is getting a better reputation. Attempts to constantly put Oakland down doesn’t change the fact that it is experiencing a noticeable positive transformation. As I said I live in Oakland, but I enjoy any progress of any Bay Area city, including San Francisco. Hopefully once Uptown Station is complete and there is additional infill in the area along with Broadway Valdez development, this area will a vibrant hub. Absolutely. Taking shots at Oakland when San Francisco has so many issues with dirty streets and crime, is really amazing. There is really nothing in Oakland as dirty and crime ridden as the Tenderloin. It’s amazing that such poverty, blight and crime exists in the heart of San Francisco. Yeah, we might even talk about its future as as office building since – ya know – 90% of the leasable space is slated for offices. Statistically Oakland has little “back office” space – 101’s musing notwithstanding – mostly headquarters for govt agencies and companies that are tied to Oakland or the Eastbay, or professionals that deal with them (so mostly HQ’s, just not many of them). And that’s probably likely to continue, with either a startup, a major company opening a Bay Area office, or a soon-to-be formerly SF firm joining the likes of APL and Blue Shield and relocating. DO is still pricey…how pricey? Well, the macy*s in Minneapolis recently sold for $59M, so one-third the price for a building three times as big suggest the Bay Area’s “back room” is worth about nine times the Twin Cities “living room”…other business districts should suffer so. That’s very true. Oakland commercial real estate is not cheap. Everyone has made a huge profit investing in this building. Also, didn’t the building generate offers or interest from 30 buyers? The only problem is that construction is taking far too long. APL is long gone, btw In 2009 it moved to Singapore. But there are definitely lots of HQ’s, start ups, and secondary offices in Oakland. In this recent expansion, a fair number of companies have moved or expanded to Oakland in fields like engineering, architecture, health care, etc. When is the trash filled Oakland city government going to undergo a complete renovation? 3.75 MILLION taxpayer dollars wasted on some spat between two totally incompetent, corrupt “old school” politicians. Desley Brooks and Elaine Brown. Oakland is a LAUGHING STOCK of the bay area and the entire west coast for a lot of very good reasons. Everett, I swear you may be me! I just began working near Twitter and City Hall in the past 6 months… what a mess down there. I have been in Oakland my entire life and only now have had to come to SF to work. I cannot believe how the human waste and drug issue is not top news. When I excite Civic Center I avoid all sorts of bodily waste from blood to HUMAN POOP (you see newspapers near that says its not a dog)! And the open needles are everywhere. Then again it comes down to tourist $ that is led by complete mass media manipulation. And so, speaking of office space (see above) it seems it’s been adopted. And bad news with the good: I finally got a look inside today, and, as far as I can tell, they didn’t keep the marble floor. Now perhaps there was a good reason – maybe it crumbled unexpectedly when equipment was driven onto it, maybe it was so polished from millions of feet it was no longer ADA compliant, maybe new/stronger floors were needed for shear resistance, but I have a hunch ’twas only b/c some nimrod wanted a “tech” look. 🙁 (Hangs and slowly shakes head in disappointment/disgust) If you’re given lemons you try to make lemonade, here they were given Chateaubriand and gave us table scraps.